tpdnews: Point of Entry Policing-Andrew Sq. Point of Entry Policing-Andrew Sq. On March 18, 2015 at approximately 5:17pm Transit Police officers were conducting Point of Entry Policing at the MBTA's Andrew Sq,station. 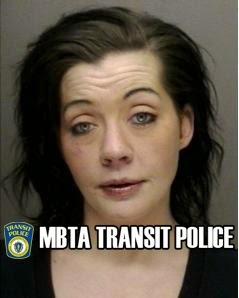 While there they observed a female, later identified as Julie Hall, 33, of Roslindale fare evade by "piggybacking" in behind a paying customer. Officers approached Hall for the purpose of issuing a citation and subsequently discovered there was a warrant in existence for her arrest issued from Boston Municipal Court and Chelsea District Court for Shoplifting. Hall was placed into custody and transported to Transit Police HQ for the arrest booking process. Transit Police K9 Zombie receives Vest. Trespasser struck in Beverly. Confirmed fatality. Boston man punches out train window. Trespasser struck in Cabot Yard. Vintage Trolley Vandal;Identified and Arrested !! Trespasser struck at Norwood Central.